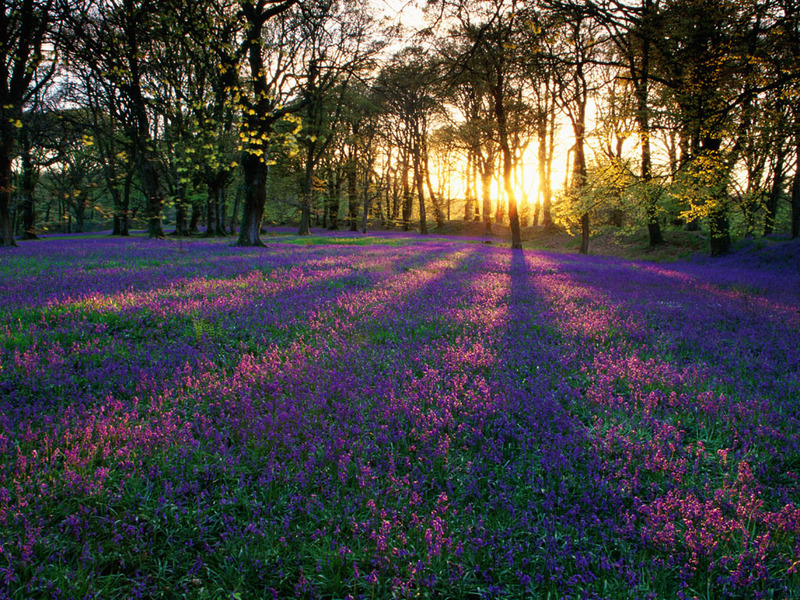 As the sun’s first, golden tendrils crossed the horizon, the flowers started to come to life. 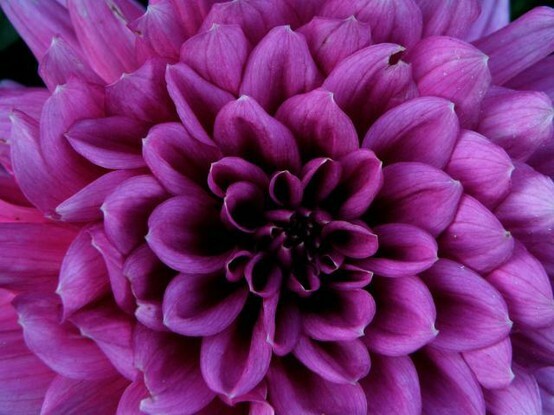 With a nod and a jerk, the chrysanthemum slowly unfurled its tight bud, quivering in the slow warmth that turned the blue-black sky into shades of purple and pink. Droplets of dew flew across the field as it straightened its sleepily curved, bright, green body. The droplets landed on the freshly tilled soil below the flowers, turning its earthiness moist and fresh, loamy and sweet. The pink-gold light continued to spread across the purple, morning sky, triggering a chain reaction in the fields below. The dahlia rose leaned over to poke the white lilies who tapped the peonies who gave an awakening jolt to the slumbering violets who gave a kick to the white chamomile who came to with an indignant shake. In a chain reaction, the flowers opened their tight buds, issuing forth a tidal wave of sweet, dewy, delicate florals, mixed with the brightness of spring green notes and a light hint of earth. They carried hints of the woodiness of the slumbering trees encompassing the meadow, the dryness of the bales of hay at the edges, and the smoke rising from the shepherd’s cottage in the distance. As the sun rose higher and higher in the sky, the notes rose in strength, becoming less dewy, fragile and fresh; turning more potent; and carrying a little hint of soap. All too soon, it was late afternoon and the woody floral scent awoke the tall trees whose mighty trunks shook with a quiet murmur as they came to life. The trees were creamy and white, as soft as taupe suede in their touch. When the sun started to set over the Spring meadow, they extended their branches protectively over the fading, sleepy flowers and took over the night shift. It was their turn to stand guard. Sunrise to sunset in a Spring field of flowers, touched by creamy woods — that was my experience with De Profundis, a 2011 creation of Serge Lutens and his favorite cohort in olfactory adventures, Christopher Sheldrake. It’s a lovely fragrance — matched by an even lovelier purple juice in the bottle — and one which is quite ethereal at times. De Profundis is described as a chrysanthemum soliflore — a scent devoted primarily to one single flower — but it is much more than that in my opinion, and far more than the mere “chrysanthemum and incense” summation provided on the Lutens website. I’ll leave the rest of the Lutens description for now, because I truly don’t think the back story for the fragrance really applies to De Profundis and it may, in fact, be a little misleading as to what scent you should expect. chrysanthemum, dahlia, lily, violet, earthy notes. chrysanthemum, gladiolus, dahlia, chamomile, peony, woods, hay, violets, incense and candied fruit. chrysanthemum, dahlia, violets, lilies, peony, chamomile, hay, incense, woods, green notes, ISO E Super, and earthy notes. The real key is chrysanthemum, a flower which has a dry, woody, sometimes hay-like undertone to its florals, along with a definite green side. It can sometimes smell a little like marigolds, in my experience. In contrast, dahlias can often take on a rose-like accord, while peonies can sometimes be like a mix between roses and lilacs (to my nose). That is definitely the case, here, with De Profundis. De Profundis opens on my skin with a fragile, haunting and delicate bouquet of flowers. There is chrysanthemum with violets, green notes, white lilies and sweet, wet earth. Lurking at the edges are the peonies, chamomile flowers, incense and green notes. The chrysanthemums are the core base but, at this stage, the top notes really smell (in order) like white lilies, violets, delicate, light roses, and purple lilacs. The incense is interesting because it doesn’t feel like churchy smoke but, rather, more like something sweet. Perhaps, myrrh with its lighter touch. I also detect the smallest whiff of ISO E Super, the aromachemical that is often used as a “super floralizer” and to give longevity to floral fragrances. The fragrance feels ethereal and very much like a call to Spring. The green notes dancing in and out, alongside the wet earth aroma that a gardener would know so well. The flowers feel incredibly dewy and light, almost tender and soft. It feels as though they are just waking up, releasing the airiest of delicate floral scents. De Profundis is, at the start, a slightly cool fragrance; it’s almost chilly in its delicacy. As time passes, however, the floral aroma becomes stronger, more robust, almost as if the flowers have fully bloomed in the sunlight. The dew has evaporated, the petals unfurled, and the meadow floor comes to life with earthy softness, light smoke, and every bit of green around. The peony and dahlia combination adds some warmth to the dryness of the chrysanthemum and to the coolness of the lily notes. As the incense recedes, the bouquet feels even sweeter. Underneath it all, however, there is an odd metallic clang. There is almost a cold, tin-like aspect under the delicate bouquet and it grows in strength as the incense and wet earth notes fades. I think it stems from the ISO E Super, though I’m relieved that it is minimal and completely in the background. I do admit that it adds a very velvety touch to the base of the flowers, but something about that metallic note is also a little discordant amidst the delicate, ethereal flowers. By the end of the first hour, De Profundis is almost like a photo-realistic bouquet at the florist, complete with the freshly cut, green stems. Lilies tinged with a delightful undertone of almonds dance a duet with the chrysanthemums that feel like a steely mix of roses, earth, and dry woodsy notes. There are elements of hay, peppery ISO E Super, dahlias and a hint of violets. There is also a light soapiness underlying the mix; I’m not normally a fan of soapy notes, but it’s extremely soft here and quite muted. But the mesmerizing thing to me are the green notes that undulate in frequency and strength. Sometimes just a hint, sometimes more, they always feel as though a florist just took shears to some thick green stems and cut them, releasing that lovely, wet, greenness. Perhaps the greater beauty lies with the woodsy notes and their development starting at the 90 minute mark. The wood accord feels as soft as buttery suede. I actually do imagine suede: creamily taupe, almost velvety, with the brown hue coming from the woods that protectively surround that spring meadow in my mind. De Profundis’ breathy, dewy, fresh opening has been replaced by a supple smoothness and sensuous softness that is incredibly elegant. As time passes, that note is supplemented by surprising hints of dry almonds and creamy vanilla. Incense returns to join the mix as well. The flickers of smoke feel almost like the black vanilla bean flecks in almond ice-cream. The combination sweetens the wood note, turning it into a cross between sweetened hay, white woods and suede, atop the merest suggestion of vanilla. At the start of the third hour, De Profundis is a skin scent of chrysanthemums, incense, buttery smooth, suede woods, and a hint of soap. The floral note almost smells like carnation at times, but I wonder if that is the merely the power of suggestion as carnations and chrysanthemums are often linked together in the West for funereal purposes. Speaking of which, I suppose now is the time to bring up the perfume’s back story. Turning gravesites held in perpetuity over to Life – a familiar of these haunts – the chrysanthemum invites Death to leave the cemetery and offer us its flower. I intentionally held off the company’s back story for De Profundis because I think it creates a very misleading — not to mention, depressing — context for the fragrance. I truly don’t visualize any of this when wearing the beautiful purple juice. And, despite the frequent mental association of chrysanthemums with funerals in the West, I don’t think you’ll think of such dark, grim things while wearing De Profundis. Even in the final drydown — when the perfume smelled a lot of carnations, with light smoke, a dash of soap, and amorphous purple flowers like lilacs or hyacinth — it never felt funereal or somber. So, I urge you to put the whole thing out of your mind and not let it dissuade you from trying the fragrance. [H]aving learned of the origins of De Profundis, one might expect a somber composition of funereal darkness. 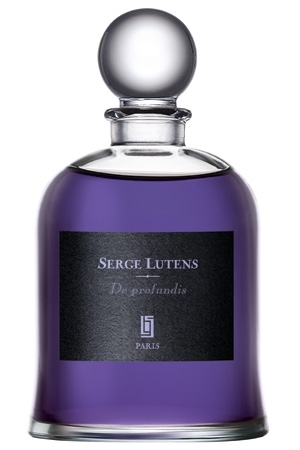 Nothing could be further from the truth—De Profundis is a soaring, ethereal vignette of green flowers, full of surprises and such magic twists that I once again have to take off my hat to Lutens and his perfumer Christopher Sheldrake. [T]he genius of the composition for me lies in its marriage of surprising elements. On the one hand, De Profundis has a classical woody oriental structure where the incense and woods create a mysterious, sonorous effect; on the other, its crisp green floral accord has a radiance and freshness of Balmain Vent Vert, Jean Patou Vacances, or perhaps even more so, Nina Ricci L’Air du Temps. As the composition develops, the velvety richness of incense fills the spaces in between the leaves and petals, while the dewy bluebell impression that I found so captivating persists into the late dry down. I find De Profundis exquisitely beautiful and serene, rather than overly cerebral and dark. I fully agree with Victoria. In the rest of that review, she describes De Profundis as being effortlessly elegant, “spellbinding” and captivating. She’s also correct about the sillage and longevity, writing: “[g]ossamer, yet long lasting and possessing a great sillage, De Profundis is a floral composition for those who like their blossoms more abstract and complex.” Where I part ways with her is on the issue of the incense. On my skin, it was extremely light and subtle, while a number of commentators on Fragrantica never really experienced it at all. Speaking of longevity, De Profundis lasted approximately 6.5 hours on my perfume-consuming skin. It was actually a surprise, given that I’ve read reports of it dying on some people after quite a short period of time. Its sillage is always low, though it didn’t become a skin scent until just after the third hour. And, though it’s an extremely airy, lightweight, seemingly sheer fragrance, De Profundis is much stronger than you’d suspect if you bring your arm to your nose. Like Victoria, I think you’ll be disappointed in De Profundis if you’re looking for a dramatically intense, diva-like floral. I also think you’ll be disappointed if you’re looking for a pure floral. 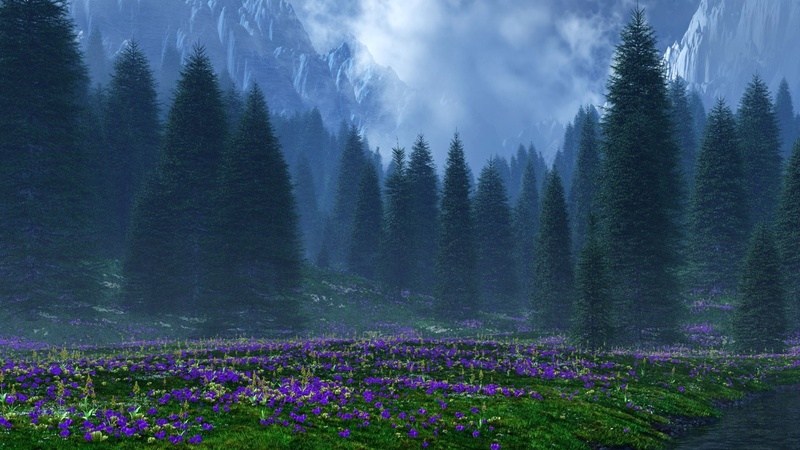 De Profundis is not a bouquet of flowers but, rather, the whole damn meadow and adjoining forest — from the earth to the green stems to the suede, buttery woods. It’s a discreet, unobtrusive, but haunting scent, and I think a very wearable one, too. Not all Serge Lutens are thus, since they can sometimes be more akin to abstract, olfactory art (Tubereuse Criminelle — I’m looking at you! ), but I can easily see De Profundis as a fragrance that you’d wear to the office, business meetings, a walk in the park, or tea at the Ritz. It may not be a date-night fragrance, but its elegance and those buttery suede woods may surprise you. 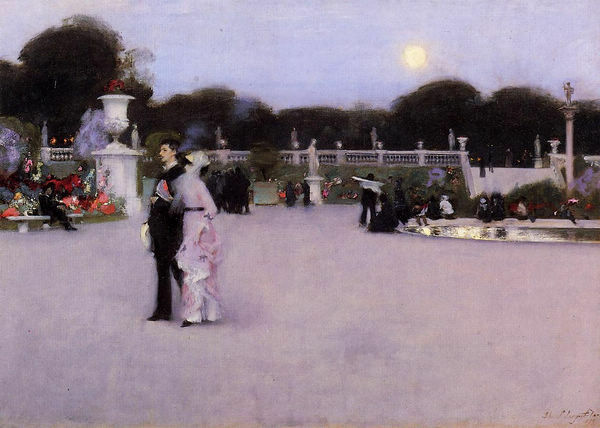 “Luxembourg Gardens at Twilight” – by John Singer Sargent. Most of all, I think you will find De Profundis to be an introverted, haunting, slightly melancholy, cool fragrance that is always elegant. It truly evokes purple twilight and Spring flowers. Try De Profundis, and take a walk in the meadows or in the Luxembourg Gardens at twilight. Cost & Availability: De Profundis is part of the Serge Lutens “European Exclusives” line, which means it is available only in the larger 75 ml Bell Jar size. It retails for $290 for a 75 ml/2.5 oz bottle. You can find De Profundis on the Serge Lutens website (US and international), but it is also sold exclusively at the New York Barney’s store. The Barney’s website states: “This product is only available for purchase at the Madison Avenue Store located at 660 Madison Avenue. The phone number for the Serge Lutens Boutique is (212) 833-2425.” In Europe, the price is considerably cheaper at €125 from the French Lutens website or from their Paris boutique. For other countries, you can use the Store Locator on the Lutens website. Sample vials to test it out can be purchased at Surrender to Chance (where I bought mine) and start at $3.99 for a 1/2 ml vial. This entry was posted in Florals, Fragrances, Perfume Review, Serge Lutens and tagged Christopher Sheldrake, De Profundis, De Profundis Perfume Review, perfume review, Serge Lutens, Serge Lutens De Profundis by Kafkaesque. Bookmark the permalink. Thanks for recommending. When I have a chance I probably will give it a try but as I said, I won’t be especially searching for a sample of it. So far there are only two Lutens that I can wear easily. I have a sample of this that I’m going to have to revisit. I remember it being very flowery and I think the backstory made me expect something completely different than what I was smelling. It seemed cold to me but more of a morning chill type of cold as opposed to a funereal one. I’ll need to give it a spritz later to refresh my memory a bit more. I think I must have liked it because I remember thinking it was too bad it was one of the exclusives and not more widely distributed. Also, it’s really a great looking shade of purple. A morning (or twilight) chill is a lovely way of describing it, Poodle. I’m glad it didn’t feel funereal to you, either. That backstory certainly can lead one to a different set of expectations with this one. I think Uncle Serge was in a very dark mood when he wrote it. LOL. As for the limited distribution, it’s a shame, isn’t it? I think I would like a small decant of this one, and will have to try to get in on a split or something. I dug out my sample and tried it again. It smells like mums so maybe that’s why he gave it such a depressing story. I would imagine anyone who only associates mums with funeral bouquets might get that impression from this. I have mums blooming in the garden in the fall so I don’t instantly connect them with death and funeral homes. Actually some rose scents remind me more of a funeral home than this one does. I think you’ll like it, Kevin, though I suspect the sillage will be a problem for you given how your skin eats up projection. I think you’d love it, Brie. It’s hauntingly captivating but also very serene at the same time. Almost soothing. Yet, it has that wonderfully velvety feel underlying the middle phase. So lovely. Introverted and haunting is how I would describe De Profundis too. It’s one of my favorite bell jars. Hazelnuts, huh? Hmmm, would never have said that about DP, but the power of suggestion . . . maybe not roasted hazelnuts, but raw ones? Well, the Hazelnuts is Barney’s addition to the mystery ingredient list. I can’t say I smelled it at all! I’m so glad you loved De Profundis too. It’s quite haunted me since I tried it and the last time something did that for me was my beloved Alahine which I ended up getting a big bottle of. I think you’d find De Profundis to be incredibly soothing and serene, Vicki. 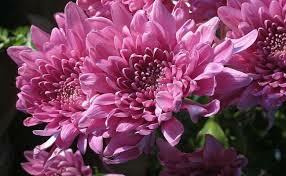 Of course, it may depend on your mental associations with chrysanthemums/mums. I don’t find them to evoke negative things, but I also found the perfume to be more than just the Chrysanthemum scent, too. The chrysanthemum is the sole pretext for writing these lines. I`d love to get a bottle of De Profundis for myself! Its such a serene fragrance and definitely captivating and one of a kind. Great review, Kafka! I like this perfume very much. I plan to write my story about De Profundis one day and I’m glad that you did this detailed review – now I know what to link to when I’m ready. I think it’s a very beautiful perfume – the color, the scent, the bottle. And its price in Europe is much more reasonable – EUR125. Lovely review, Kafka and the perfume sounds like it is worth a try. I am hesitating slightly because I am one of those whose scent memory of flowers is associated with funerals, specifically my grandmother’s when I was six. There were so many floral wreaths that the smell of flowers permeated everything and everywhere. I can’t help but think I’ve smelled this at Barneys but I will make it a point to do so…along with Bas de Soie. I’m still hankering after Boxeuses though and will need to ask scent triplet Undina about the Paris scent mule who could acquire a bell jar for a more reasonable fee than pay Barneys’ almost 85% mark up. I want a perfume mule to bring me the De Profundis at a cheaper price!! 🙂 lol. At the very least, I’m now determined to hunt down a decant of this from some group or another. I truly loved it that much. I found myself thinking about the smell LONG after it was gone, even days later and again tonight. I’m not normally one who is drawn to hugely serene scents, but this one was almost haunting to me. Well I will let you know 1) if I love it and 2) whether she’ll be in France before I see her. Not sure either will be the case but I will let you know! No, you never told me. What a shame about the longevity! And you don’t have particular problems in that area, the way I do. So sad. It is definitely a haunting scent and I can’t stop thinking about it myself, even with its iffy longevity on my skin. I still want some which is quite unusual for me given that I don’t normally fall for florals. What do you mean exactly about the water in the vase? Floral-scented water or pure water? No, like the smell of the water you throw away after a bouquet has died. Obviously, not that pungent or rancid – floral, but in a slightly decaying way. I truly can’t stop thinking about how glorious it smelled, I positively loved it. Ah, murky, brackish water. Got it. Has to be the chrysanthemums. Well, perhaps it will last more on your skin in cooler weather? It’s such a delicate fragrance that I’m sure it would have better life with cool to cold temperatures. That is my lingering hope – that in the cooler weather it will truly shine. But my GOD, it’s beautiful. Truly. Probably my favorite Lutens I’ve smelled thus far. I’ve really come around to loving a lot of florals, and this one is pitch perfect. You are totally right. I will LOVE this. Must find some right now….. (It’s half 11 at night here)…. De Profundis is a scent that will wrap itself around your heart in such a way, you’ll feel transported and utterly HAUNTED by its beauty. 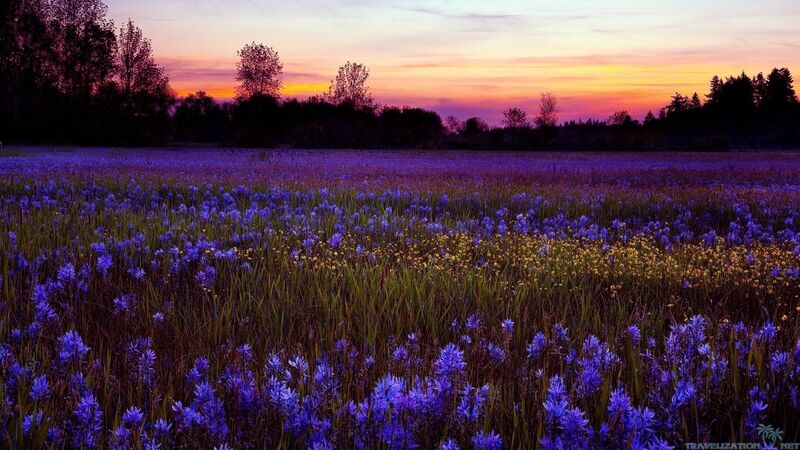 It is like every purple-hued floral siren in the world calling to you. Its beauty is so exquisite, any attempt to really explain it and capture it (including my own) is simply inadequate. There is something about De Profundis, something ineffable that one can’t pinpoint or explain, and it’s all the more beautiful for it. It doesn’t last particularly long on my skin, which is a pretty big deal for me, but the lure of De Profundis is such that I’m pretty sure this is the bell jar that I’ll buy when I go to Paris this Fall. Ask on FFF if you can buy/get a sample from any of the British members. I don’t think you’ll be able to get samples from the usual British sites like Les Senteurs, etc, since it is one of the Paris Bell Jar exclusives. Do yo think it’s good for a man? I think it will really, really depend on your tastes and style. What sorts of things do you like in terms of genres, and what are some of your favorite fragrances? I think De Profundis would work for some men, but most may find it too delicate. For something much more masculine, much stronger, but in the same vein, I would recommend Chypre Mousse by Oriza L. Legrand. Less floral, and more herbal, mushroomy and mossy, with a tiny leathered undertone and resinous vein, but it has the same mood and feel as the Lutens, minus its delicacy. I hope that helps. Feel free to look up the Chypre Mousse articles, or to ask more questions if you have any. I read your review on Chypre Mousse. I’ll receive my sample soon. I am very curious about it, but I have lot of expectation for Trayee. I try this week Chypre Palatin, I think it’s a work of art, but not suitable for me. Maybe this fact can give you an exemple of what I think it’s better for women. I really like Memoir Man, Jubilation XXV, Encre Noir, Black Afgano, Fille en aiguille, but I am searching a fragrance more delicate, more smooth, more organic, more light, for doing meditation or let me be inspired. If you tell me how Chypre Palatin manifested itself on your skin, I’ll have a better idea not only of how your skin chemistry may work with notes (amplifying, hiding, or detracting), but also the notes that you struggle with. That would be a help. Thank you for the list of things that you like, as that is also useful. You clearly like smoky, plummy, vetiver, deeply resinous and/or woody scents, while simultaneously not having problems with aromachemical synthetics (JubXXV, Black Afgano, and the very ISO E Super Encre Noire). I think Trayee may work well for you in terms of something more meditative, but lighter. It has “hefty weightlessness” to coin one reader’s description for Bertrand Duchaufour’s style. A much more austere, much drier, less complex scent that you may want to consider is Naomi Goodsir’s Bois d’Ascece. It is a very, very different kind of smoky woody scent, and quite simple at its heart, but it may suit for what you’re looking for. As a side note, given the choice of perfumes that you like, I would suggest trying Olivier Durbano’s Black Tourmaline as it fits very much into the whole Fille en Aiguilles, Black Afgano vibe. It didn’t work on my skin at all, as the pine notes went very south, but that’s a skin chemistry issue and others have had more luck. I still don’t know what your skin does to scents or particular notes, but look up Black Tourmaline for another dark, woody, smoky, incense scent. My difficulty in making other suggestions is that I don’t know what your definition of “delicate” and “more organic” may be, especially as something suitable for meditation or general inspiration is such an individual, personal matter. I hope you will come out of lurkerdom and give me a chance to know your tastes and style better. For now, I would suggest staying away from De Profundis, as you don’t seem to be the floral sort of chap, and that really is the heart of the Lutens. Perhaps in terms of something lighter, but also woody, incense-y, and warm, you may want to look up SL’s Fourreau Noir? It is lavender, incense, patchouli, and amber. In terms of deeper, richer scents, there is the magnificent Amouage attar, Tribute, but I don’t know how light that would be for meditation. The smokiness of that one though…. it’s worth trying as a general matter! Honestly, Trayee may be your best bet, then perhaps (depending on your personal goals or tastes) Naomi Goodsir’s Bois d’Ascece. What I get from Chypre Palatin is a lot of castoreum and sort of moss (i am not sure of the note), blended with floral in top notes. Sometime one note evoke in me an idea of metalic, I don’t understand what it it’s, but it’s not so pleasant. I think it’s something in the base that I don’t like. Maybe he only give me a similarity with one perfume of my mother (I thinks it’s Niki de Saint Phalle, it’s oakmoss dominant note). This base blended with some floral don’t inspire me. Associated a fragrance with my mother it’s fun, but not a good thing with a fragrance on me. In my imagination, what I gets with Black Afgano it’s something of a wet tobacco, aoud, sort of resin and little of incense. It’s raw green, like a dirt swamp with something sweet or just nice to sniff. What I like of this fragrance, it’s his feelings he give me, sort of: grounded, raw, heavy, natural and sophisticated at the same time. From Fille en aiguilles I have got lot of pine with incense. Firt he remind me Avignon incense type but with pine dominant note; maybe too much pine (Pine Sol or other bas association). It’s an art fragrance for me, not one to wear often (poor versatility). For Memoir Man, it’s one of my favorite, my signature scent. I got Incense, well blended with fresh note of sort of mint. Very complexe on my skin, sometime I can have a lot of leather, or be hit by tobacco, and other notes. To this day, they fit really well with the image I giving to me. It’s meditative, complexe, strong and subtle, contemplative. For Jubilation XXV, mainly I got a lot of dry fruit with incense feeling, blended with others notes who I still don’t know. This intensity make give me a real jubilation. It’s a pure joy. A fragrance only for my pleasure, I think it can be disturbing for the others. Encre noire giving me a lot of vetiver, with cypress and wood. I like de wet feeling of it. Sometime I sniff a note who I dislike, but this don’t stay. It’s organic for me. I also really like Lyric Man from Amouage, I got a lot of rose petals with some green notes. I like this kind of floral. Now, my expectation for De profondis, I search a fragrance more floral, more subtle with more gleam (lots of my frags are dark or heavy). I want it floral, but more like a garden than only petal flower. I want to smell leaf to, the green, the warmth of it. I don’t want a floral who smell like synthetic or like a candy. I want he give me a feeling of warm, beautiful, delicate and raw nature. In the other hand, I have a question. Black Afgano is hard to find, do you know a fragrance who can give me a similar feeling: «grounded, raw, heavy, natural and sophisticated at the same time.» Maybe Slumberhouse Norne or Black Tourmaline?? Sorry for my english, I speak french and I use google translate to help me. Ne t’inquiétes pas, Simon, ton anglais est vachement bon, meme avec l’aide de Google. Mon français est completement rouillé, alors pardonnez mes erreurs, okay? Je n’ai pas essayé Norne, mais mes copains avec un goût pour JubXXV, Black Afgano, etc, l’aime beaucoup. Mon suggestion: peut-etre Private Label de Jovoy pour une version de vétiver avec un forêt fumée. Tu peut également essayer Lonestar Memories d’Andy Tauer pour un parfum avec beaucoups cuir fumé, boisé, profond, balsamique et un peu fruité. En considération de ton information sur le pin en Fille en Aiguilles, tu dois peut-etre rester loin de Black Tourmaline. Sur moi, le Pine-Sol était fou. Pour un parfum floral commes tu déscris, je penses que le Chypre Mousse sera ton meilleur choix. Sans doubte. Okay, that was far too much French writing after far too long. LOL. My writing was always the worst part, especially the bloody accents, so let’s stick to English for now. But I do hope that helped. Maybe I should have used Google too. lol The funny thing is that I could read the French in your English, through the references to perfumes like “he” etc. And it made me miss my childhood home. If I think of anything else, I’ll try to add to this. Oh, I almost forgot, if you like deeply animalic, musky but smooth leather with woods, darkness, incense, and stunning REAL sandalwood, and if you are near anywhere that carries LM Parfums, my favorite new scent in years is Hard Leather. But that is a very difficult fragrance that really depends on skin chemistry, tastes and how animalic you like things. On some skin, the leather turns into barnyards cow smell. It doesn’t on me, but a handful of people have reported that for the first 15 minutes. They say it goes away though. Also, if you like animalic notes (think vintage Kouros’ animalic undertone), you will want to try Opus VII from Amouage. Deeply, DEEPLY dark, woody, raw, musky, leathered, oud-y, and “skanky.” Hard Leather is softer, more sandalwood-y, more leathered, less foresty, and more incense-y. But they have a common feel. I adore, adore, ADORE Hard Leather!! But, again, it’s not an easy scent and isn’t for everyone. But if you’re in Europe, you can try it easily. If you’re in NY, Osswald NY may get it soon to add to the rest of the LM Parfums selection.